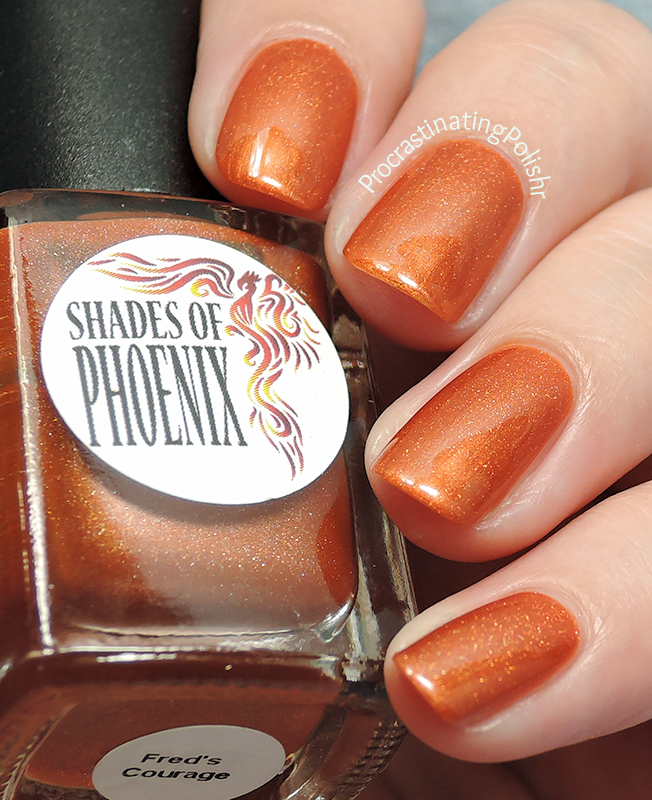 More geeking out over Harry Potter is in order today with the new collection from Shades of Phoenix - Shades of Potter being released last night. 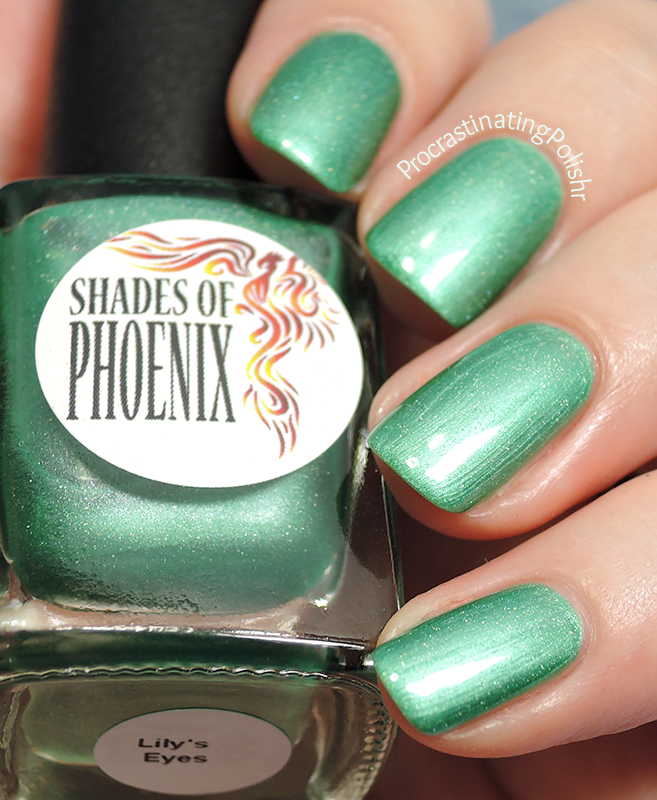 We all know how much I like to geek out over both nail polish AND Harry Potter right? Yes! Brilliant! 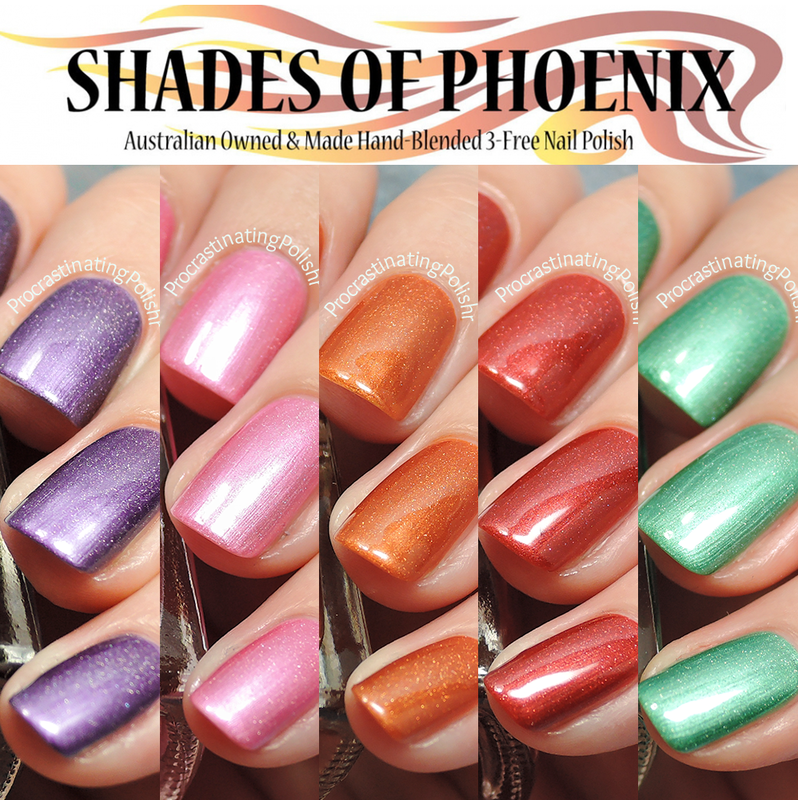 The Shades of Potter collection is a range of shimmering pearlescent colours with a soft scattered holo effect. I used three coats for each shade, and finished off with top coat. "Dementors are among the foulest creatures that walk this earth. They infest the darkest, filthiest places, they glory in decay and despair, they drain peace, hope and happiness out of the air around them..."
A lovely regal purple tinged with icy shimmer and a softly scattered holo. I do love a nice purple and ended up wearing this on my right hand for several days and it lasted the distance well. I did not find it sucked hope and happiness out of the air around me when wearing this polish, which is probably for the best. Though I envision deathly black when I think of a dementor, I like the darkness that lies underneath an ethereal surface you get with this polish. As is the nature of a pearlescent shimmer, you will see some brushstrokes. Thanks to the scattered holo, they essentially disappear at any kind of angle so I didn't find they bothered me at all. I even caught myself admiring the gentle sparkle of the holo, and I'm a holo grinch! 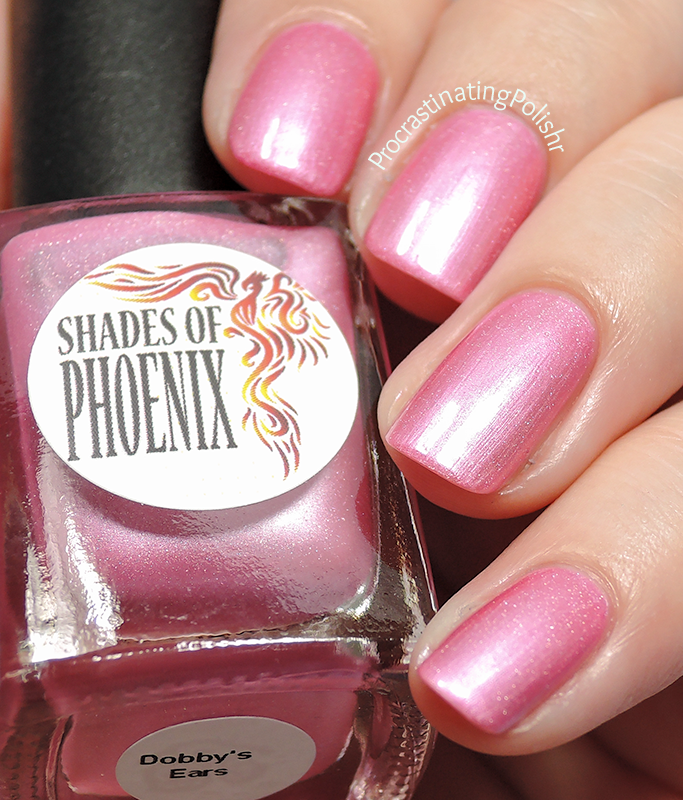 Fairy floss pink that is just cool enough for me to pull off. It's not pastel, but it's not exactly bright either. It helps that I think of the sweet and loyal Dobby when wearing it. At first I thought the colour and name connection was a bit tenuous but I grew to love it. Dobby is sweet and timid, but bold when he needs to be. Plus his flappy bat wing ears are kind of unmissable! Dobby's Ears had the smoothest finish of the collection, with a lovely soft appearance. "The thing about growing up with Fred and George, is that you sort of start thinking anything's possible if you've got enough nerve"
Glorious fiery orange, you must be a Weasley! 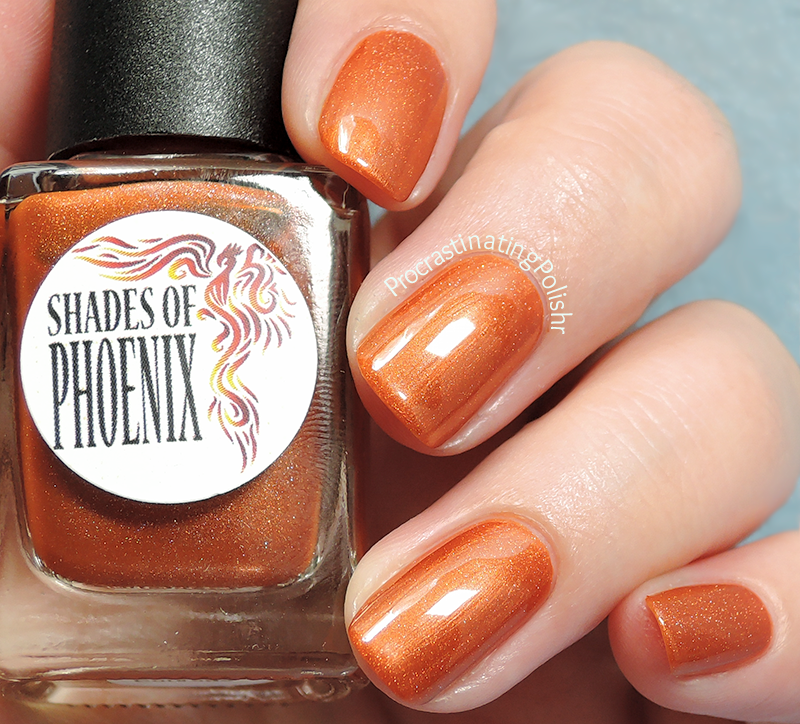 I want to call this shade... grilled pumpkin orange? Whatever it is, it's fabulous. 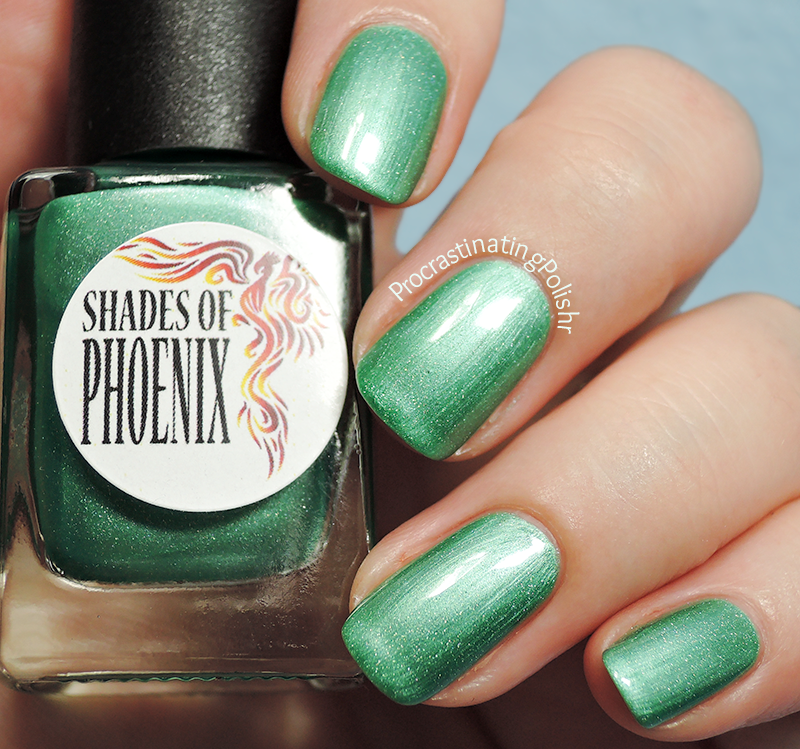 The name of this polish definitely made me a little foggy in the eyes. Over the course of the series you grow to love (almost) the entire Weasley clan, and twins Fred & George are the older brothers everyone wanted to have - smart, funny and always looking out for you. Fred did just that until the bitter end, in a story full of untimely deaths his was particularly hard to grapple with. Fred's Courage had a every so slightly thicker formula than the others, but application was just as easy - if anything, I think it contributed to the lovely smooth finish. I really like the holo that brightens this polish, it seems so joyful. "But that Weasley girl! What's so special about her?" 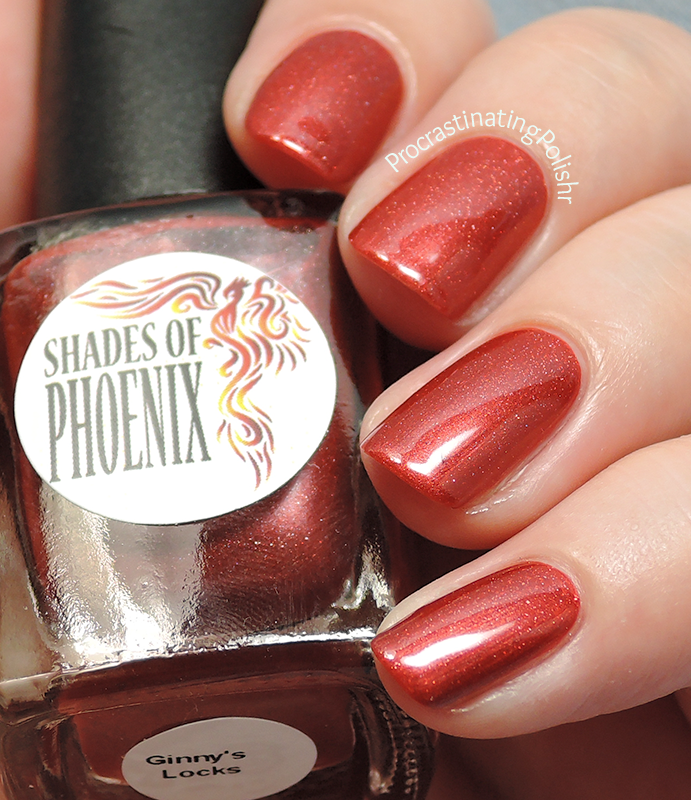 I love that I now have two polishes inspired by Ginny Weasley! 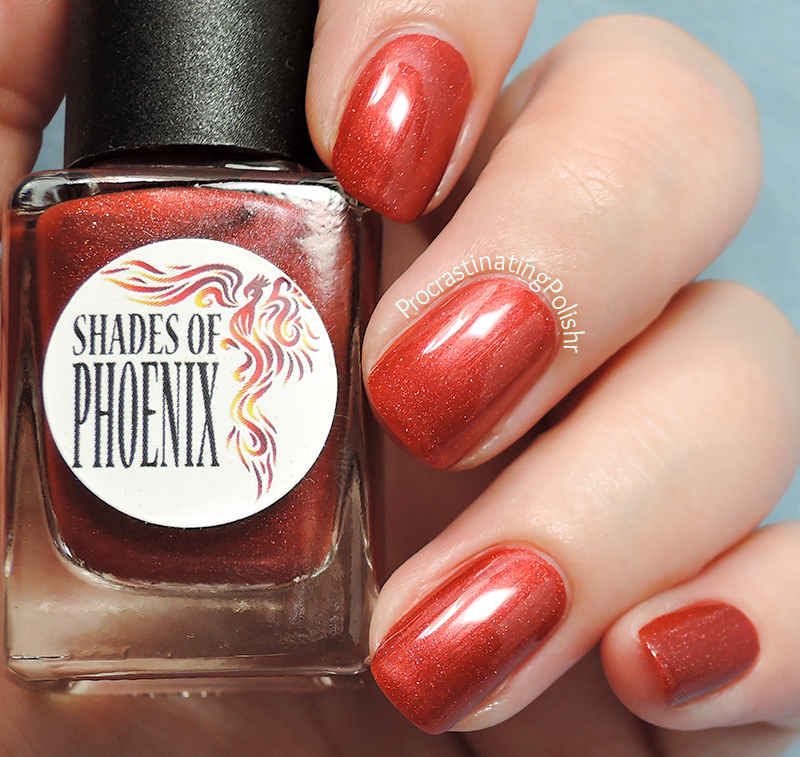 This rich red leans dark (I like a good brown undertone in my reds!) while being buffeted by the light shimmery finish. It's not just Ginny's Locks that are full of fire, she starts off a girl with talent and wits who grows into a fierce young woman you do not want to mess with. Ginny is one of the under appreciated heroes of the series so I do love seeing a bit of Ginny in a bottle again! 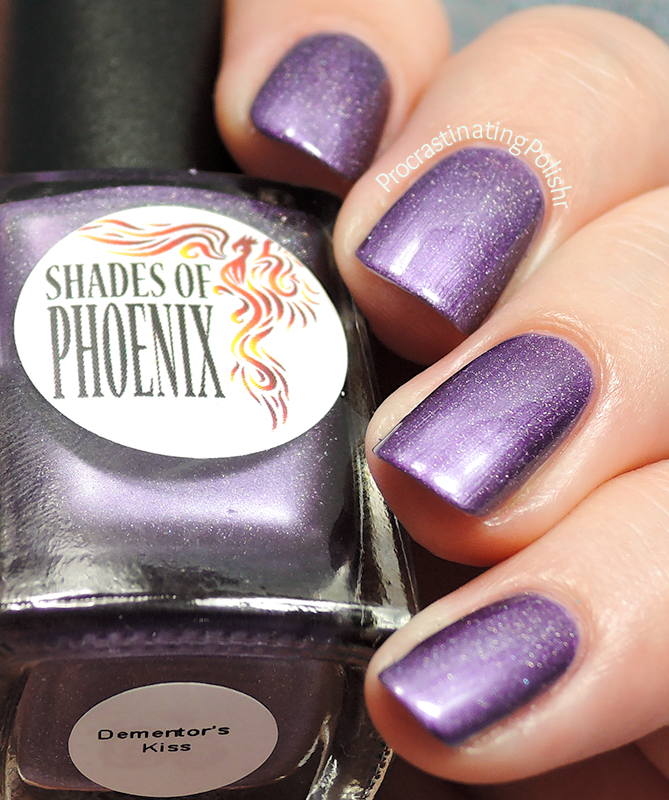 Ginny's Locks has a lovely smooth finish with minimal brushstrokes and the holo is not shy in this one. "Look at me... you have your mother's eyes"
Lovely cool toned spearmint green that looks a little grassier in low light. I'm still wearing this on the left hand as I type, almost three days after application and still going strong. It's almost ludicrous just how often Harry is told he has his mother's (green) eyes, so much so the internet is full of memes about how the movie versions of Lily and Harry do not have the same eyes. Nonetheless, it's definitely one of the most repeated things about Harry's appearance (besides the scar, obv). I found Lily's Eyes was the brushstrokiest (shhhh it's now a word) of the bunch, but other than my ring finger it smoothed out with top coat. I should also mention what appears like VNL in the photo above is just a weird quirk of my nails where it flexes up at the quick - certain angles and foil/pearl finishes always emphasise it. I admit that I was not initially excited about the idea of a pearlescent polish with holo - two of my least favourite finishes together made me doubtful. However despite my preconceptions I found myself really enjoying wearing these polishes - they're a little bit of refinement for a glitter fiend like me while still having a bit of shimmer to catch your eye. 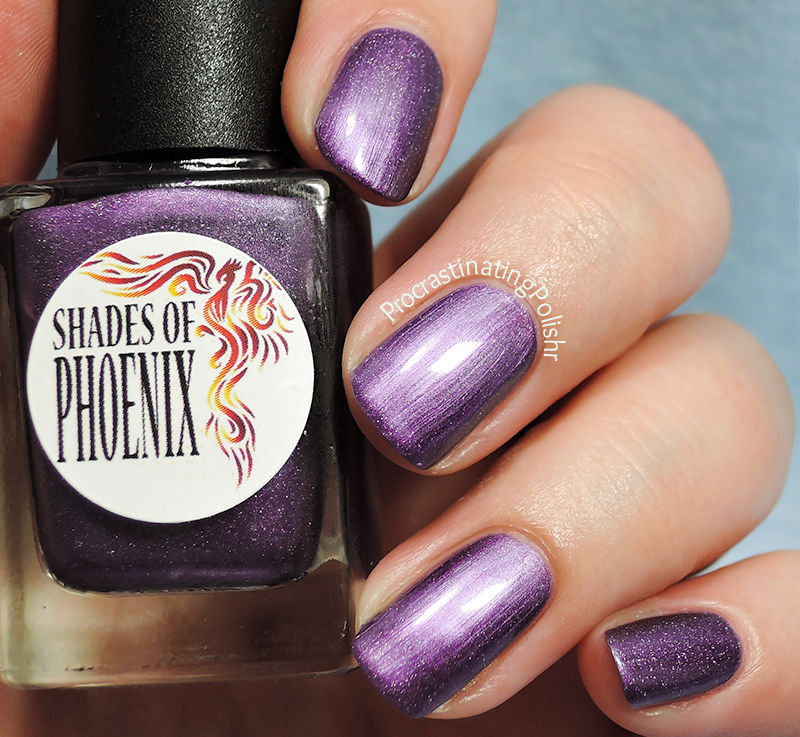 The collection is available now from Shades of Phoenix, while you're there check out the listing for the May Mystery Mani-Fest nail art box - preorders are open until May 16th and you don't want to miss out!